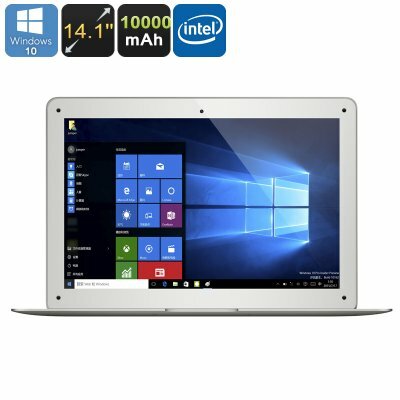 Successfully Added Jumper EZbook 2 Ultrabook Laptop - Licensed Windows 10, 14.1 Inch FHD Display, Intel Cherry Trail Z8350 CPU, 4GB RAM, 10000mAh to your Shopping Cart. The Jumper EZbook 2 is a great laptop that now comes with a highly affordable price tag. With its thin design and sleek appearance, this notebook certainly is a feast to the eye. Coming with a licensed Windows 10 operating system and appropriate hardware this laptop is perfect to use for online gaming, watching movies, browsing the web, and a whole lot more. Its compact and light weight design makes this Chinese laptop the perfect notebook to carry along no matter where you’re headed – allowing you to conveniently carry along your personal files anywhere you go. Equipped with a stunning 14.1 inch FHD display the Jumper EZbook 2 portraits vivid colors and high detail when you are enjoying your favorite media. Bring your pictures and movies to life in breathtaking 1080p resolution – with this notebook you are guaranteed to take your media experience to entire new heights. Coming with 64GB of internal storage and the possibility to add another 128GB externally provides this Chinese laptop with enough storage space for you to save all your personal files. Its Cherry Trail platform that features a Z8350 CPU and 4GB RAM is guaranteed to improve your overall user experience by providing you with lightning fast operating speeds. Normally running at 1.34GHz this processor is capable of reaching burst frequencies up to 1.84GHz. This ensures that your laptop uses less power when used for simple tasks while, at the same time, it can speed up its performance when needed – allowing you to play demanding games and multi-task without dropping a single frame. Along with its massive 10000mAh battery the Jumper EZbook 2 can take you through hours worth of continuous usage time, allowing you to browse the web or watch a movie without needing to worry about battery life. Its licensed Windows 10 operating system has been installed in English, however, can be easily updated and changed into numerous of other languages. Now for sale and available at a remarkably low price, the Jumper EZbook 2 is the perfect affordable laptop for business and leisure alike. The Jumper EZbook 2 comes with a 12 months warranty, brought to you by the leader in Windows laptops as well as wholesale electronic gadgets..
Windows OS is pre-installed in Chinese and English, other languages need to be downloaded by WiFi. Overall the laptop does what they say it does. I'm very happy with mine. Fast, clear screen, lightweight, battery lasts forever, charges whilst in use instead of discharging, plenty or memory , and great looking, will be buying more to sell in shop & website.